Hanoi, Vietnam -- The Perfume Pagoda festival is an annual pilgrimage that takes place in the mountainous Perfume Pagoda region south of Hanoi. According to local legend, the area is Buddha's heaven and around 30,000 pilgrims make the special trip to the area every year. Pilgrims start at Chua Thien Chu (Pagoda Leading to Heaven) and follow a path up to the Perfume Pagoda itself. Traditionally, this stage of the journey would be completed on foot, with many refreshment stalls and other distractions set up along the way. However, this year for the first time, travelers will be able to reach Huong Tich cave, at the summit of the Pagoda, via a new cable car network, which begins operating in January. The cars run from Thien Mu Pagoda at the base of the mountains to the cave itself and are capable of carrying 1,500 passengers an hour. While making the journey up to the Perfume Pagoda – specifically known as the Huong Tich Pagoda – it is traditional for pilgrims to greet each other with calls of "A Di Da Phat", loosely translated as "Praise Lord Buddha, may he bring health and luck". Once in the sacred cave, travelers will encounter a mood of quiet contemplation. Impressive statues of Buddha and Bodhisattvas dominate the cave, surrounded by incense and other decorations. The festival lasts from the first lunar month of the year, which in 2006 begins on February 12, and lasts until the end of the third lunar month. Traditionally, the busiest day of the festival is the 19th day of the second lunar month, which according to legend is the birthday of Princess B. 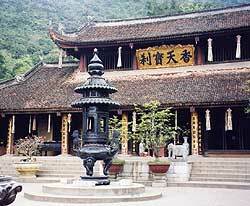 The perfume Pagoda is near the village of Huong Son, situated around 69 miles south of Hanoi and accessible by road. Travel to Vietnam from the US has been made easier in the past year, during which United has been offering regular flights from San Francisco to Ho Chi Minh City. This week, the airline celebrated the first anniversary of the route, which it bills as a "historical" service, improving tourist and trade links between the two nations.